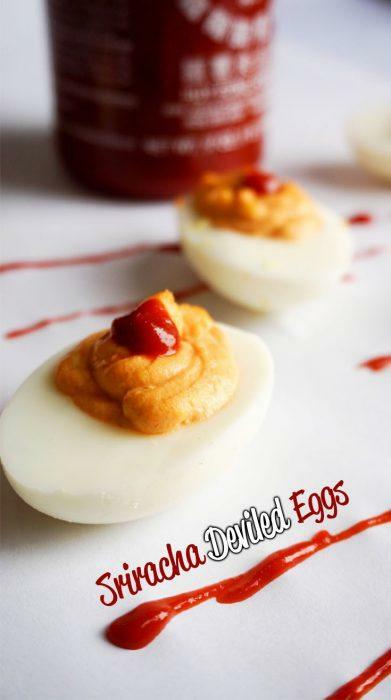 This is the first of a series of deviled egg recipes. Why? Because I'm obsessed with them, and you should be too! Hard boiled eggs and mayo, what's not to love? You can add any extra ingredient to kick them up a notch. 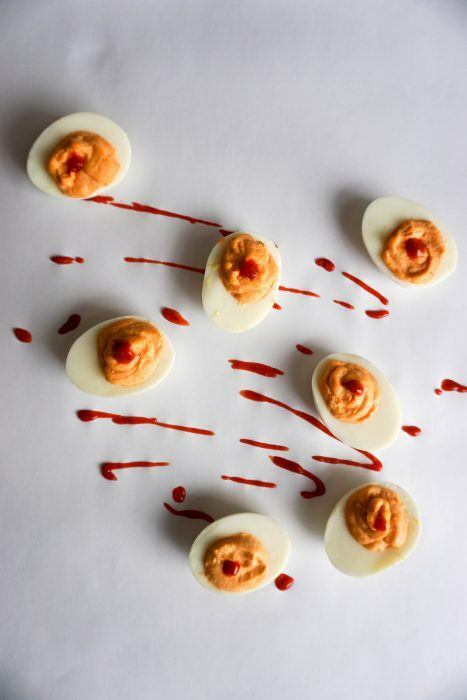 First up is Sriracha Deviled Eggs! The best part about this recipe is that they are extremely quick and easy to make. 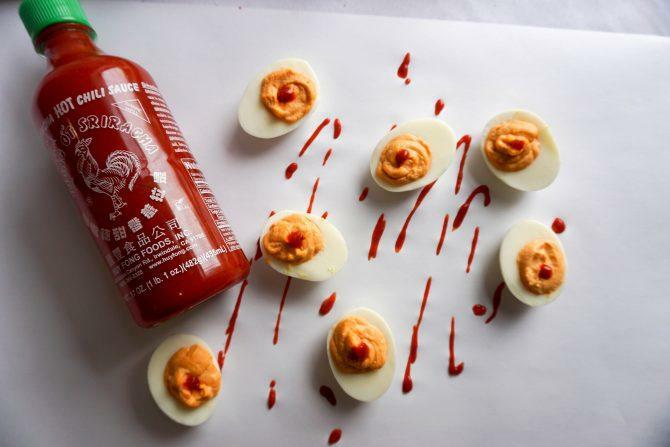 All you need is hard boiled eggs, mayo, Sriracha and some salt and pepper. The hardest part is resisting eating them as you make them. I always sneak a couple in before they make their way to the gathering I'm bringing them to. 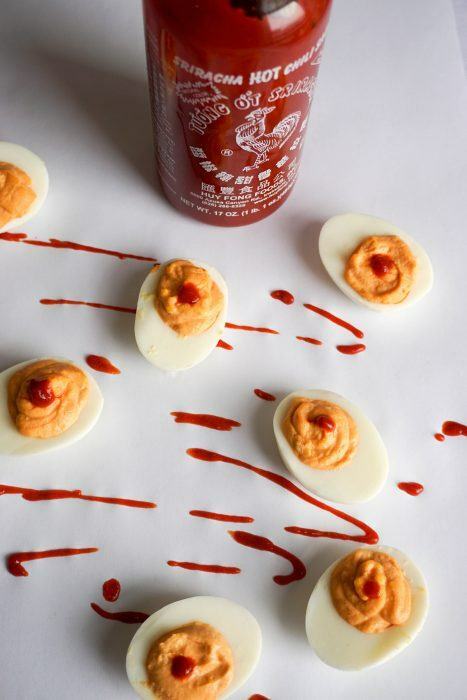 People are also generally impressed and excited about the deviled eggs, especially when you add a twist like Sriracha! Sriracha Sauce is a vital ingredient to have in any household. If you don't have any, shame on you, if you do have some, we'd be great friends. I am always mixing it with mayo to top any breakfast meal, burger or even for dipping my pork rinds in. It really adds so much flavor and spice to this recipe that I recommend using more than is called for as long as you aren't sacred of a little spice! This is actually the first time we've used Sriracha in a recipe, but it won't be the last. A little truly goes a long way and it can be paired with almost anything in my opinion! If you are a fan of eggs and want something else to top your Sriracha with I highly recommend you also make our C﻿hicken ﻿Eg﻿g Foo Young and Cauliflower Fried Rice recipes! You won't be disappointed. Be sure to keep your eye out for the next two recipes coming your way in the next couple weeks because if these Sriracha Deviled Eggs didn't tickle your fancy, they sure will! 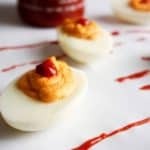 Recipe can be quickly added to MyFitnessPal - Search "KetoConnect - Sriracha Deviled Eggs"
Cut hard boiled eggs in half lengthwise. Scoop yolks out into a bowl and set the whites aside. Add mayo, sriracha and garlic powder to yolks and combine well. Dollop some of the yolk mixture into the hole of each egg white. Garnish with a drop of Sriracha. Enjoy!